The Doctor is back, or should I say John Smith – the Doctor’s usual human alias. In an episode that featured so many quick references to past Doctor Who story elements – John Smith, River Song, Coal Hill School -, none were given more than just a passing mention. 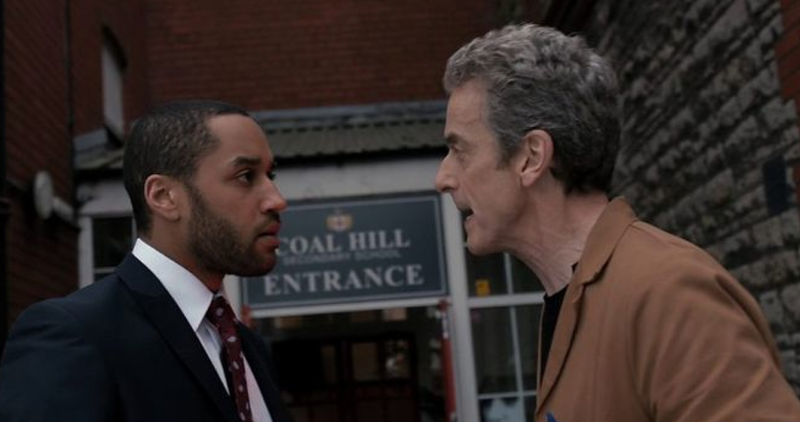 Instead, the bulk of this episode focused more on the confrontation between the Doctor and Danny Pink. Considering the Doctor’s unexplained hatred for Soldiers, we knew this would happen sooner or later; but the severity to which it did actually tainted a lot about this episode. Were there still some good points in this episode to think upon? Of course, but the overall feeling at the end was one of awkwardness and annoyance. So let’s step once more into the Tardis and explore the weakest episode this season – thus far. Up until now, we saw the Doctor exhibiting some passive aggressive tendencies towards Clara’s – yet to be known to the Doctor – boyfriend. From “Listen” and “Time Heist” we know that he is lonely and feels that Clara is going to be taken away from him sooner or later. Though when the Doctor first ‘thought’ he met Clara’s bow-tie wearing boyfriend, he seemed oddly okay with it. Why? The reason is because that ‘bow-tie wearing coworker’ looked a lot like Matt Smith. Now when I first saw this, I thought it was just me jumping to a conclusion; but the Doctor himself even points this out later. 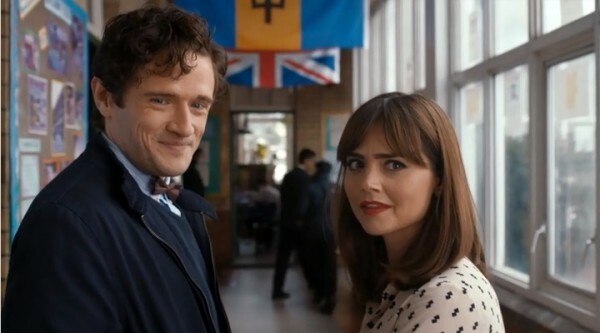 If Clara was going to date someone who looked so much like the Eleventh Doctor, then the present Doctor could be okay with that since he remembers how Clara and his former self did have a romantically tinged chemistry. In this case, it’d prove that Clara will always care about the Doctor and that he has played just a huge role in her life. Sadly, this was not the case. The man Clara would actually be dating was a ‘soldier’, someone who stands against everything the Doctor is – or at least this Doctor seems to think so. To make matters worse, Clara even scoffs at the idea of her dating the Eleventh Doctor look alike because he’s “not her type”. In the Doctor’s mind, Clara has just erased what the Eleventh Doctor meant to her and gone against everything he has tried to teach her. Though as we’re about to discover, the Doctor isn’t the only one with wild and jealousy-filled accusations. The Doctor certainly threw quite a few insults at Danny Pink – deeming him only fit to teach PE (Physical Education) being one of them. Though when the actual argument took place on the Tardis, it was Danny who came across as the most nonsensical and insulting. Danny immediately latched onto the name ‘Time LORD’ and faulted the Doctor as being too upper class. As we know, the name Time Lord is a race and not the Doctor’s own title for himself; but it didn’t end there. Danny then painted the Doctor as the cold hearted army man – the commander – who orders you to take lives. In Danny’s mind, the Doctor is the kind of man who can order his underlings to do anything, no matter how much regret the underlings have to deal with. Even if the Doctor does ‘push you’ to be better, there is eventually something that you can’t handle. To someone who has watched Doctor Who for a long time, this is the moment that broke the episode for you. It’s not that it didn’t make sense – because Danny could never know any of this – but because these accusations about the Doctor are SO wrong that it actually infuriates the viewer. We’ve learned a lot about this new Doctor this season; but there are some things the Doctor never is – and Danny’s accusations showed everything the Doctor isn’t. Many people have mocked the Doctor’s accent, mannerisms, appearance and just general otherworldliness. Though there is one thing that you can never mock/accuse the Doctor of: not caring about those close to him. Sure we’ve seen a much more removed Doctor this time around; but he still always watches over those people close to him. We’ve seen how the Doctor has taken loss in the past. He’s becomes depressed and shoulders all the blame himself. In many ways, this Doctor feels it more than his past few regenerations. He is haunted by his past deeds and thinks he’s not a good man. Though as Clara pointed out with “Into the Dalek”, he tries to be; and that’s what matters most. So for Danny to accuse the Doctor of not trying and just ordering people around is insane. The Doctor – this one especially – might not come out and say it; but you know he cares for those around him and the thought of losing them drives him crazy. Peter Capaldi has said that this new Doctor “doesn’t really fit in anywhere except out there”; and Danny’s words cemented that in the Twelfth Doctor’s head. He keeps opening his heart to a companion; but then they leave. Worst of all, this one is leaving him for someone who is his complete opposite. There’s no denying that Danny Pink is obviously a good guy; but that doesn’t make him a positive character. Sure Danny might have a regret or two from his service in the military; but in the context of the story he could never comprehend how much regret and loss the Doctor has had to face. By accusing him, Pink shows just how ignorant he can be. Though it is his final words to Clara that really send a bad message for the series. The End of A Strong Female Companion? Moffat’s Doctor Who has usually been cited as being horribly sexist; but this season seemed different with Clara always being such a strong force. She not only holds her own up against the Doctor; but also stands on par with him and saves him many times. So when Danny starts laying the law down and giving Clara an ultimatum, he went from just knowing nothing about the Doctor to knowing nothing about Clara either. 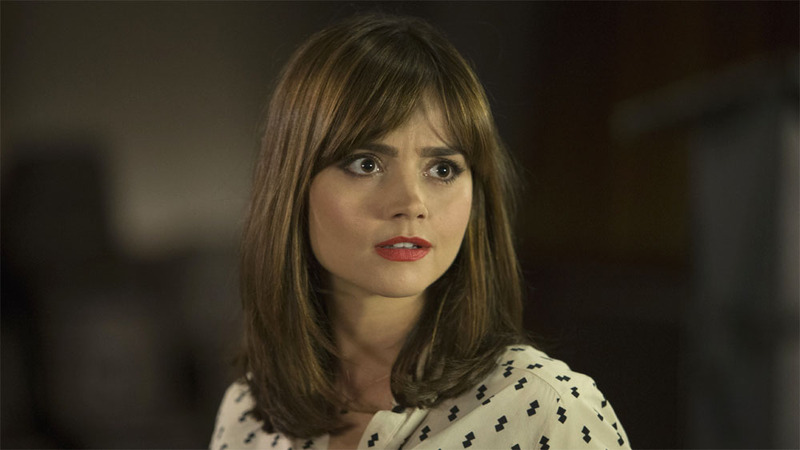 Clara is an exceptionally strong character who has been in some crazy and dire situations; but she never lost faith. She pushed herself and has always come out on top, even when she thought she couldn’t. So to hear Danny say that she won’t be able to handle something and will be pushed too far not only twists the Doctor’s words; but also belittles what Clara is capable of. She’s the ‘Impossible Girl’, not the girl in over her head! It’s safe to assume that ‘a moment she can’t handle’ will come; but after everything she’s been through that moment would come across as horribly demeaning and way too scripted just to once again return Clara to the role of damsel – despite showing countless times she is not. What will happen next has me worried; but it seems as though Moffat might be back to his old ways of ‘woman just cause problems that men have to fix’. If this continues, then the Doctor Who won’t just be losing a companion; but possibly one of the strongest self-defining female character yet. He – and we for that matter – just want someone to be good enough for Clara; and right now Danny isn’t it. Having us already see their ‘future’ was an awful choice in retrospect after this new information. Missy Is Busy . . . Why Does That Sound Bad? It seems we’re back to normalacy with another brief appearance/reference of “The Promise Land” and Missy. So what did we learn this time? Well it seems our ‘afterlife/Death’ theory is holding up pretty well. Though the real question remains WHAT has Missy so upset. Until now she seemed like Mary Poppins creepy twin sister; but this time around we saw her much more serious and . . . pissed off? Why is she so “busy today” as her assistant put it; and what does this mean for the Doctor? Was that killer android dumped in the wrong place? 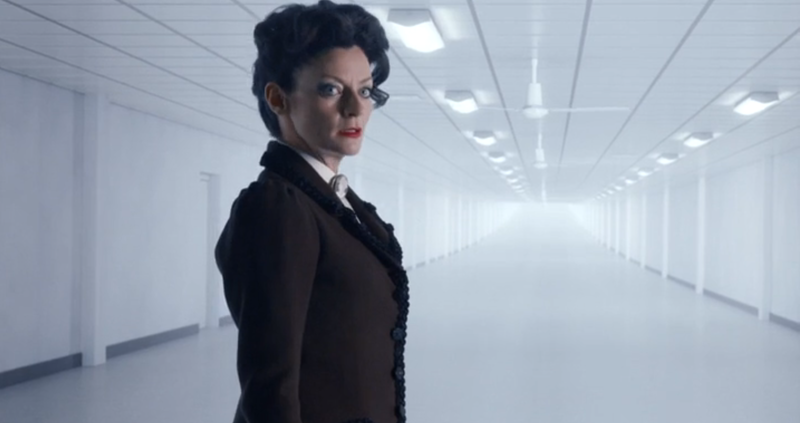 Is Missy upset that Clara and the Doctor are drifting apart? Guess we’ll have to wait to find out. Will Miss “Disruptive Influence” be joining the team for any future missions? Hopefully not because last Season’s “Nightmare in Silver” already taught us that bringing a child along is an AWFUL idea. Whether Doctor Who, Once Upon A Time, Walking Dead or Power Rangers Turbo, the theme remains the same for this genre: bringing a child along will cause more problems and fix none. Either way, next week’s Alien-esque episode will bring us to the moon where something sinister has taken over. So stay tuned! Remember that Doctor Who began by having a “child” along. Courtney is about the same age Susan was (the character, not the actor) and it worked fine. Ditto Vicki, and Nyssa. Nightmare in Silver didn’t work because the episode was badly written (a rare misfire for Neil Gaiman and for the series in general). We don’t know what Kill the Moon is going to be like, but based on what I’ve seen in terms of preview images and the like, I don’t think it’s going to be the same thing. I think that the child actors have been fairly strong in the Moffat era. Like you, I usually find child actors intensely annoying, but Caitlin Blackwood as young Amelia was superb, as was the lad who played young Kazran in A Christmas Carol, and the children in Beast Below, Hungry Earth and Doctor, Widow, Wardrobe were all pretty good too.